It's a great time to be a sales organization. I often find myself wondering how different things would have been 10 - 15 years ago when I first started leading sales teams if I had access to the technology, tools and data that are readily available to companies of all shapes and sizes. I can still remember reading the articles in magazines like Sales & Marketing Management, Selling Power and Selling as they debated the pros and cons of (what was then called) salesforce automation, and the challenges in getting adoption. Nothing got more attention or brought more angst to salespeople and executives alike than to topic of CRM. Back then, the choice was to either spend millions of dollars on an enterprise CRM built out to your specifications, to buy clunky, suboptimal CRMs like ACT!, Maximizer, GoldMine, etc., or to go without a formal CRM. So, if you were a small or mid-market company (SME) you either went with a clunky CRM or no CRM at all. The turn of the century brought us Salesforce.com who began what I like to call the democratization of CRM, bringing the costs down to where SMEs could afford it, with the capabilities of enterprise alternatives. While Salesforce.com was a great improvement, it was still expensive and unless you could afford to have it built out and customized to you, still clunky. Using it as a salesperson was difficult and frankly, annoying. Today there are a host of CRM alternatives that literally take any excuse for not using a CRM right away. In 2005 I would kill for the CRM choices that exist today that are free. The good news is that more companies and salespeople are using CRM than ever before. Unfortunately they're still not realizing its true promise. In our work as part of our Sales Enablement Services, we often analyze and advise on a companies growth stack, including their CRM. 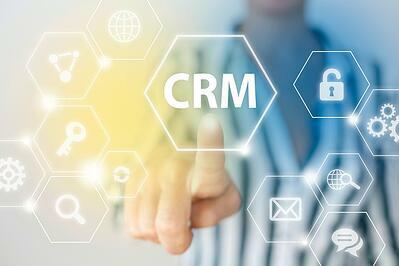 Having reviewed hundreds of implementations, I still see 5 very common - and very damaging - mistakes made when using CRM. I will admit that I fell for this one. The idea is so powerful. As a prospect moves through your sales funnel/pipeline, intuition tells you that the probability of closing the sale increases. Being able to assign a probability to each stage seemed so simple and genius. Finally, I'd be able to quickly, efficiently and accurately forecast revenue. Instead, what you get is garbage that is at best, ignored or worse, used to plan future efforts. Don't get me wrong, for the less than 1% of CRM users who have actually analyzed their pipeline stages to develop real and accurate forecasting metrics, I say, "Kudos and congrats!" For others...stop using it. The number of opportunities at any given stage. The average time an opportunity is at that stage; paying particular attention to opportunities that are at a stage for longer than a set amount of time. The value of the opportunities at each stage. Personally I'm on a mission to change sales from a gut-driven craft to a data-backed discipline. Five years ago this was not a viable mission because it was simply too difficult to track the data one needs to make data-backed decisions. That is no longer true. The problem is that most companies aren't tracking the data, and most of the few that are tracking aren't using the data to make decisions and guide actions. I'll be writing a post in the near future on the metrics to track, how to track effectively and how to use the data. For those that can't wait for that post, let me address the most common excuse I hear from companies as to why they don't track: our salespeople won't keep the CRM up-to-date or log their activities. There's a very simple way to get salespeople to keep the CRM up-to-date...and no it's not threatening not to pay their commissions. Instead, be sure you use the data in everything you do. Be sure you're coaching and managing based on data. When you're working on account strategies, refer to data to back up your decisions. The real reason salespeople don't keep CRM information up-to-date is they don't see the personal benefit. It's either ignored or used to punish them. Start using it to their benefit and I assure you they'll keep it up-to-date. What does this stage mean? What happens in this stage? How does a salesperson know they've left that stage and entered the next? Only about half of the companies we talk with have strong answers to the first two questions (more have answers, but they're typically vague and/or abstract). Very few have a clear answer for the third. It adds complexity and confusion to all aspects of the sales and sales management processes. It makes it impossible to actually create a "learning organization" where everybody can quickly learn and apply the lessons of others. It destroys one of the main purposes of utilizing a CRM to begin with - to create organizational discipline and one version of the truth. One of the top concerns of demand generation executives (and virtually every business owner that I know) is the ability to accurately forecast. The fact is that humans are bad forecasters, and salespeople are no exception. That doesn't mean they can't get better at it. In the first mistake, I talked about how probability-based forecasts are ineffective. Here's an approach we've found to be far more valuable in creating predictability and optimizing sales results. Rather than arbitrarily assigning a probability based on stage, require that salespeople forecast who will buy within a specific period of time (we use 90 days at Imagine, but the time period should vary based upon your sales cycle). We incentivize forecasting as early as possible; realizing you should only forecast success when you're confident. Were you to look at our pipeline, you'd see some very early stage opportunities are forecasted to close, and some late ones aren't. This allows us to more confidently manage the future and allocate time and resources to the opportunities based upon what we see. We don't stop there. We also debrief (and this is where the real value is). We look at opportunities that were forecasted to close that either haven't or were lost. We identify what caused us to predict success and where we were wrong. We take what we learn from that and refine our approach. We also look at sales that close that weren't predicted to. We want to know where we were wrong there as well, and apply those learnings. This is the most baffling for me. In our reviews and assessments, we talk to salespeople and ask them to walk us through their sales process - the steps they take, where and when the salesperson makes decisions and so on. Then we look at the deal stage setup to ensure they're aligned. It's rare when they are. A CRM is valuable when it helps you manage processes more efficiently and effectively; when there's one source of the truth. CRM is a crucial tool to supporting alignment through the entire demand generation process. Unfortunately, that's only possible when it's setup to align and match how things actually happen. As I came to the end of this blog post, I realized I was missing a big mistake, so here's your bonus. In 2017, if you're not using - and I mean really using - a CRM to record actions, track data and guide strategy and decision-making, then you're just not serious about growth. Additionally, your future will involve harder work, higher costs and less return. There's simply no reason whatsoever not to use a CRM today. Implementing and managing a CRM does not have to be an overly complicated task. It does, however, require some important thinking and some customization so that it becomes your system of record. The companies that embrace CRM are going to enjoy far better outcomes than those that don't.